Time to think – SNOW! Roy and I had a great meeting with Mike G, the new Sno-Bird Secretary last night. I was showing them the new integration with Instagram and Roy pointed out he wasn’t aware of Instagram on our site yet. That could be because I wasn’t clear enough in my first post so I’ll try to point out how to use it. 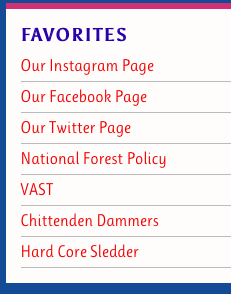 When you are looking at our website, you’ll notice a new link in favorites called Our Instagram Page. It will take you to our page on Instagram which only has a few photos but most importantly it encourages Instagrammers to add the hashtag #shrewsburysnobirds to any of their photos from our territory. Hashtags are used to group things on the web. They always start with the pound sign which is followed by a word or phase with no spaces. If you are familiar with using tags to label digital documents, it is similar to that. They were originally meant to work in searches but their use has expanded tremendously. 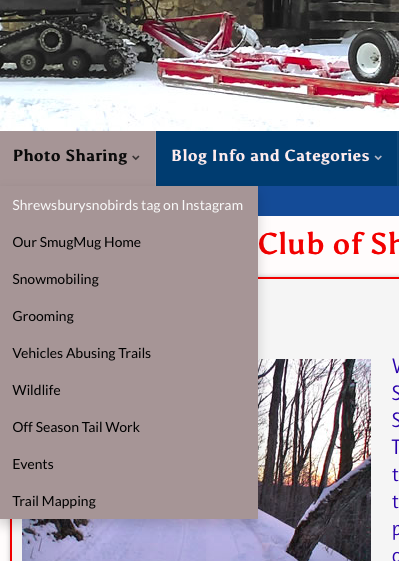 It is cool to see our photos on Instagram via the two links above but even cooler is seeing anyone’s photos on Instagram with our hashtag on a new page right here on our site: Instagram Photos tagged with #shrewsburysnobirds. Access it via the Photo Sharing button in the main menu (see below). If you have an Instagram account, all you have to do is make a comment on any pertinent photo and include our hashtag, #shrewsburysnobirds. You can do this to any Instagram photo whether it is your photo or someone else’s. Enjoy!